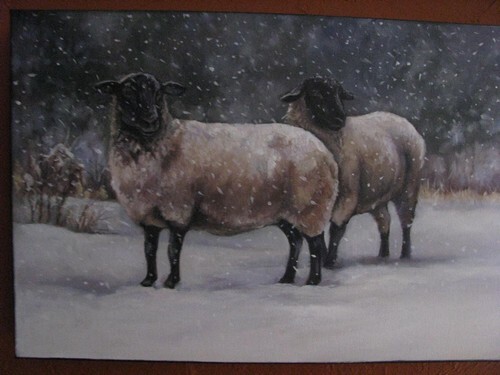 This morning I danced to Ladysmith Black Mambazo in front of a winter scene by Lynne Campbell, black-legged sheep in falling snow. I didn’t think much about winter or sheep, or Africa for that matter although I wondered if the music was inspired by the land. I would assume so, drums and heartbeat. And then I thought of a pueblo in New Mexico full of tourist buses and the woman I met as I walked across a parking lot who lived there and for some reason stopped to tell me that when the buses and the people were gone you could feel the energy of the red earth through your feet. I’m often thinking about land in one form or another and so as I danced it wasn’t unusual that I began to think about the wild, unkempt garden outside my window with its bushy native shrubs, serviceberries just ripening, rows of lettuce and cucumbers, the robins and rabbits I share this with, and then I thought beyond it to my town—not especially picturesque or special, just mine—and the lake that I love despite its pollution… the gulls, the peace, the way the lake knows how to be itself and do what it’s supposed to do despite what we do to it because we don’t know how to be—and how all of it links me to childhood, to the flinty smell of factory on my dad’s clothes as he comes through the back door—my mum, with a picnic hamper of potato salad, homemade bread, radishes, a thermos of Koolaid, another of coffee; us heading to the beach for supper and a swim. That woman in the pueblo recognized the inevitability of economics, she knew that ridiculous as it is, we’ve created a society where there are concessions that need to be made. But What Ottawa is doing—turning its back on the environment—is more than a concession, it’s unconscionable. It’s not possible to sit back and do nothing. So I dance, try to feel the earth beneath my feet. And then I wonder: what can I do? How do I sing the rhythms of this land? Thanks for writing – today and always!